Club Penguin Cheats by Mimo777 Club Penguin Cheats by Mimo777: Club Penguin's Third Annual Fall Fair And Rockhopper's Coming!! 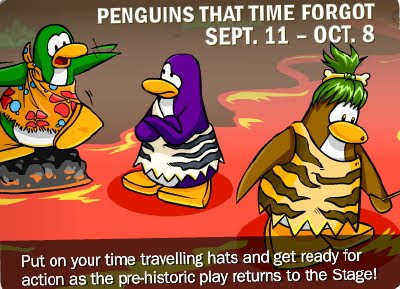 Club Penguin's Third Annual Fall Fair And Rockhopper's Coming!! YYYEEESSS! The Club Penguin Fall Fair will be here Sept. 4 - 13th! This is one of the best parties Club Penguin has to offer. 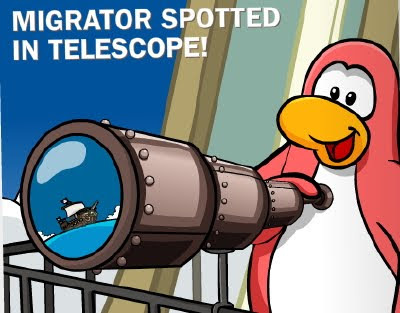 Even Rockhopper will be coming! Also, on Sept. 11th, there will be a "new" play at the stage. Well, it isn't new, but it has been a long time since we have seen this prehistoric play... Penguins That Time Forgot! Don't for get to check back here tomorrow for all the cheats in the Snow and Sports Catalog and, of course, the new pin cheat! Do you like Football? Play CAMP PETE on Mimo Games now! wow thats awesome keep up the good work! Cool mimo! And ps how do you post all of your things so quick? You are right! 12th Fish Costume didn't come back for Penguin Play Awards! That play was CP's second play, and it was AWESOME, I think! Mimo works very hard to be the first one to announce new parties and cheats etc. Maybe he wakes up very early or he's in a different time zone? Yeah, I kinda wanted the fish costume too! Hey Mimo777! Theres a new You Decide thats going to happen to put in the October catalog! If you click on the last square on the 101 Days of Fun thing it should say that. Hey There is a secrect room in the cave/inside mine. it is that pathway. u need something to get in cause i saw penguins going in it and i cant get in. Wow this sounds really fun! I havent ever been to a fair in Club Penguin! I hope there is awesome free items, and more new cool outfits! I am all about fashion designing and this party could use a great new look! I hope I get to see Rockhopper!This is a perfect chance for me to meet him. See you guys later! Hey, Parik8! Congrats on being first poster! Thats so awesome! Someday I really hope to be first! It's a Joke! Lol, yeah, I saw many penguins saying Secret Room and walking into pathways-especially at mine-! There isn't a secret room like that! The fall fair last year for non-members had 4 free itmes, and a free pin,and background. then for Members (including the nonmember items) there were 9 free items, and a free pin and background. He stays up til clubpenguin updates, and then he posts the new stuff right away. Plus he has been doing it for 3 years, so he is used to it. (The secret revealled part of the newspaper?) that all items apart from party things would make a come back. Also CP sometimes recolour items, so you could buy the red fish costume while you wait. -Waddle On! wow mimo, u sure have a LOT of mimo games! I know! That play was awesome! I wasn't a member back then but now that I have been, I really want it! All of those events are AWESOME!!! This is my first Fall Fair because I missed the one last year :(. Oh well, this one should be great, everyone says so. Mimo waits until Club Penguin Updates items on there which I believe 9:00 PST P.M. Then he postes them right away! He stays on until Club Penguin Updates items. Then he immediately postes them! I've been on clubpenguin since almost the begining, but I'm a new member! I wish they would redo the plays with awesome costumes. sweet!!! 5 things good in a row!! is this seriously the 3rd fair? i thought that it was the second one....but yay!!! Im glad your excited about the Fall Fair! And welcome to CPG! Its not a new room. The penguins were just hiding! Its a great Hide and Seek spot though! I want the 12th Fish, too! I already sent CP like 3 emails suggesting them to bring it back into the Stage! Safa153 and Zxz192, lets send CP more emails telling them that we want the 12th Fish again! Who else agrees with us? gets cheats then posts then and then goes off the computer as far as i know at least. LOL! It's just a joke people just say that all the time for example some people just randomly say FOLLOW ME FOR FREE COINS! but we all know it's a joke. LOL! The fall fair is very fun but i'm not gonna spoil it for u but i am gonna say LOOK OUT FOR ROCKHOPPER IN THE FALL! usually after summer he comes soon! The Box Dimention Is A Thing That Club Penguin People Seemed To Forget About! Im Also Looking Foward To The Fall Fair! Cool. I love the fall fair. Mimo. I was wondering if I could advertise on your blog. Thanks. I know! There's new games coming all the time! My favorite is chobots. Yeah, the box dimension is a place full of boxes. It's pretty thweet. A good thing to do is this, make a Magic Closet, and it only works if you have a box dimension portal. closet or anything that looks like one. Step 1: take out your box dimention portal and place it anywhere in your igloo. Step 2: cover it up with the closet. Step 4: personalize it! Place a cool carpet underneath to make it look professional, maybe put a red carpet leading to the entrance, make it pretty and colorful by swathing it in flowers, anything you like!! HAVE FUN! Trick your friends, have a party and make people think your magic, make people impressed and add you, or anything you have in mind! I love doing it when i'm a member, because i'm not always one... But i do love being one! Yeah i know! they didn't even put it in the Penguin Play Awards! Boo hoo! I think this is the 2nd fall fair but i may be wrong. as it says Mimo stays up till midnight, just for Club Penguin! i love the fall fair! i say it IS the best party cp ever had. Its not the Fall Fair weirdo. Its THE Fair.